A terrible, unexpected thing happened that necessitated a trip up north (what a horrible sentence, I know. It will have to make do). What this … happening … underlined was that, if you can forgive the old saw, life is short, and that it should be spent doing the things that make you and the people you love happy. So that is what we did. Maybe this was just an elaborate rationalization that people like us concoct in order to feel good about eating our feelings, but when faced with the tiny little fishballs adorning the snow-white egg noodles at Goniew in Nakhon Sawan after a crappy 24 hours and a long road ahead, the way of least resistance is also the tastiest. Goniew is a marvel in more ways than one (and easily found. Ask anyone in Nakhon Sawan and they will tell you where it is). Not only does it offer some of the tastiest, cutest little fish meatballs around, but it also serves up a gorgeously braised bowl of duck noodles, duck and barbecued or crispy pork on rice, and a decent Hainanese chicken rice. It also offers daily noodle specials (our day, an unusual choice: duck beak noodles). And it is open at 7 in the morning, an oasis in the desert of highway minimarts after a 4:30 wakeup call with no breakfast in sight and a heavy heart. 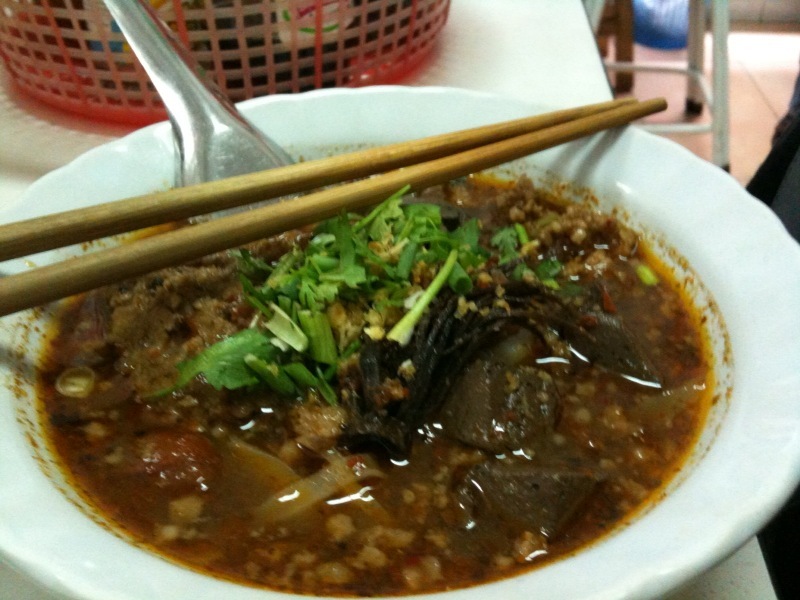 To me, khao soy is one of the more interesting dishes in Thailand. Often mistaken for something Burmese, people are sometimes puzzled as to why they can’t find something similar to this dish in Burmese restaurants. But it’s actually “Haw”, a Chinese-Muslim group originally from Burma that gradually settled in parts of northern Thailand, bringing with them this delicious soupy mix of spice and starch. Their Muslim heritage explains why the dish, if authentic, comes in only beef or chicken, and the Chinese part possibly explains the inclusion of egg noodles. 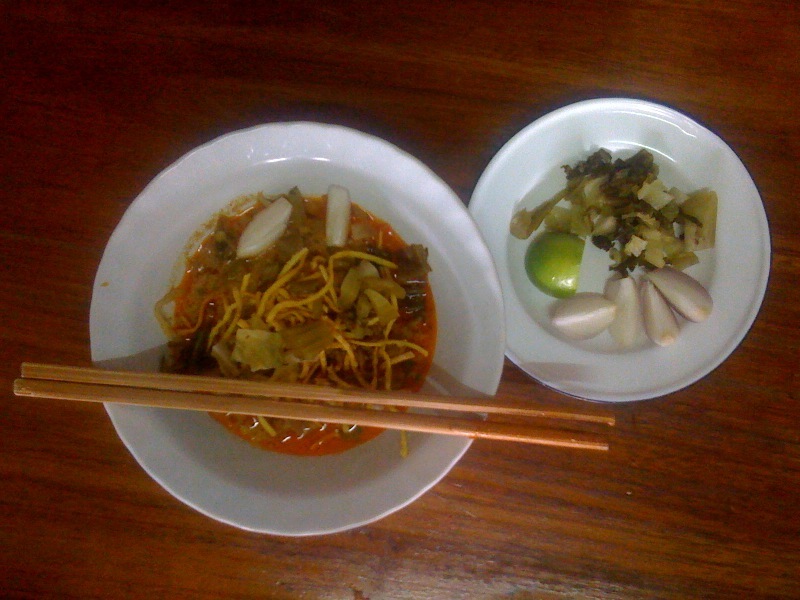 Strangely, the “Haw” attained a reputation for bland food despite the invention of khao soy. Even now, northern Thais call something bland “haw”. Certainly not “haw”: the thick, pungent stew-like concoction available at Khao Soy Islam in Lampang, famed for its horse-drawn carriages and the coin-shaped rice cakes cooked in watermelon juice. Both chicken and beef versions are similarly earthy, almost musky, but the beef — which appears to have been marinated in something strong and aromatic — is almost gamy, thick with spice. Finally, at our destination, Thailand’s northernmost city and my birthplace: a quick, hurried meal at Pa Suk, the city’s best and most well-known purveyor of that hard-to-produce noodle delicacy, kanom jeen nam ngiew. It’s hard to go wrong with either the pork and beef versions (pork is milder and fattier, beef more pungent), and both kinds are full of strength and authenticity — finally, after months of weak-kneed imitations back in the capital! 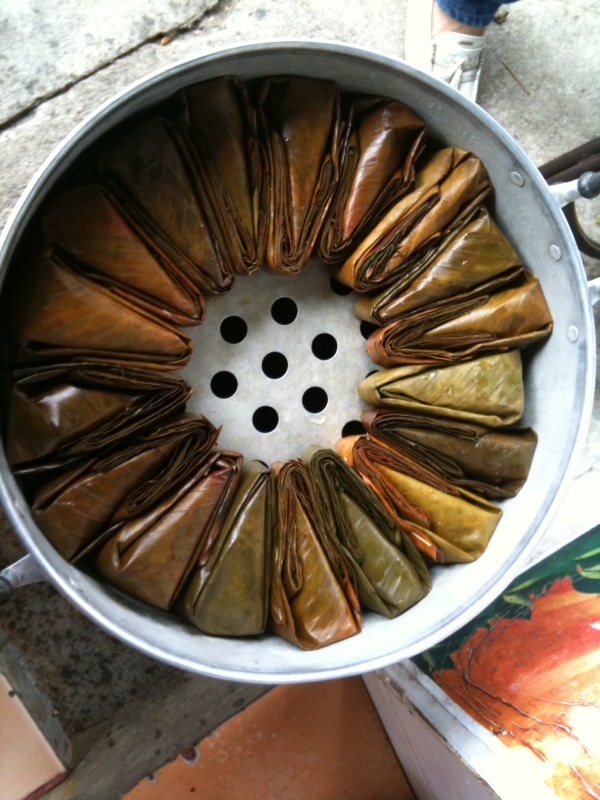 But my favorite is khao ganjin, modeled after the Shan dish in which rice is cooked in pig’s blood and steamed in banana leaves. 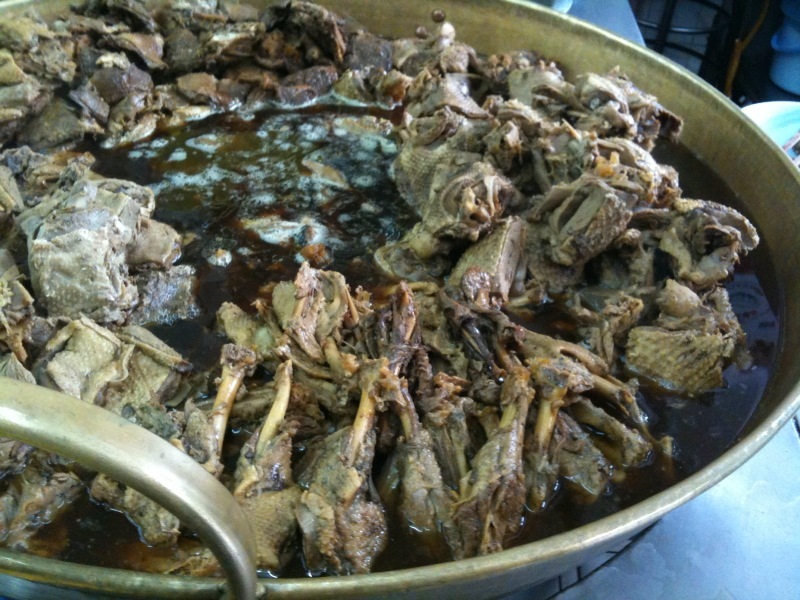 Here, it is served with green onions and deep-fried garlic oil, a punctuation point to the perfect “welcome home” meal. I agree that Pa Suk Nam Ngeow in Chiang Rai is the best kind because it has a special taste that cannot find anywhere else so far. 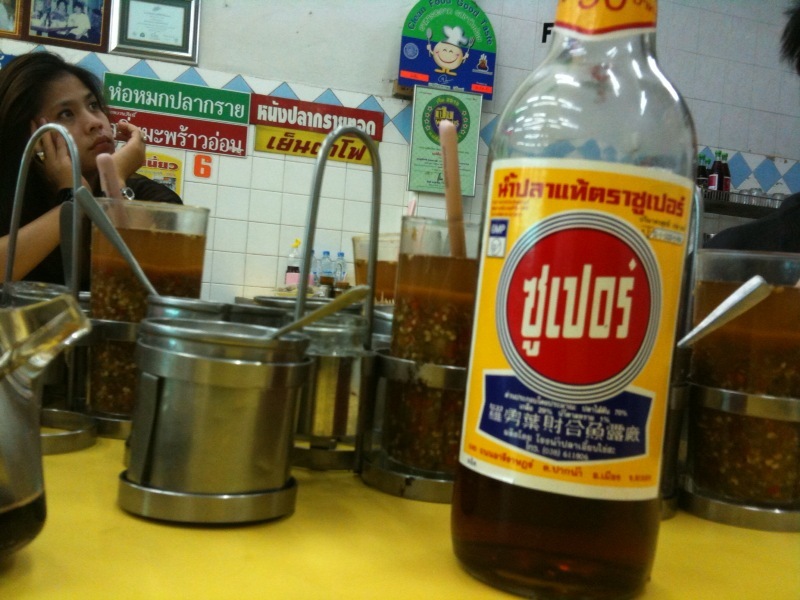 Yes, the Pa Suk in Bangkok doesn’t seem the same. Thanks for reading, dad. That car ride was nuts, however, that khao soy gai was worth it. I’m forever jealous that I didn’t take that shot of the steamed blood rice!